Malinda (the slower 1/2 of Twins Run in Our Family) is the new Philadelphia Chapter Coordinator of Medals4Mettle. We are excited to support Medals4Mettle - a national non-profit organization that facilitates the gifting of earned marathon, half marathon and triathlon medals to children and adults showing mettle or courage while dealing with difficult challenges. If you live in or near Philadelphia and want to donate your earned marathon, half marathon and/or triatholon medal(s) to children fighting cancer, please contact Malinda or drop off at any of the Philadelphia Runner stores. If you want to donate your medal(s), you are encouraged to complete the "Donor Legacy Form" available on the Medals4Mettle website. Donors are welcome to share the story behind their earned medal(s) and why they want to donate. Information gathered from those donating medals helps Medals4Mettle gain a clearer sense of their support base and may help obtain corporate sponsorship dollars in the future. To donate your medal(s), please clean your medal(s) and remove the ribbon(s). Medal4Mettle ribbons are attached to the donated medals before they are given to the recipients. If you live or work near Philadelphia, you can drop-off your medal(s) at any Philadelphia Runner store. Medal Donation Boxes are now available at ALL Philadelphia Runner stores. If you have any questions or need more information about Medals4Mettle, please review the information below or visit the Medals4Mettle website. If you have any questions about the Philadelphia Chapter, please contact Malinda. If you don't have any medal(s) to donate, please consider making a small donation of $5 or more to help purchase the Medals4Mettle ribbons for the Philadelphia Chapter. 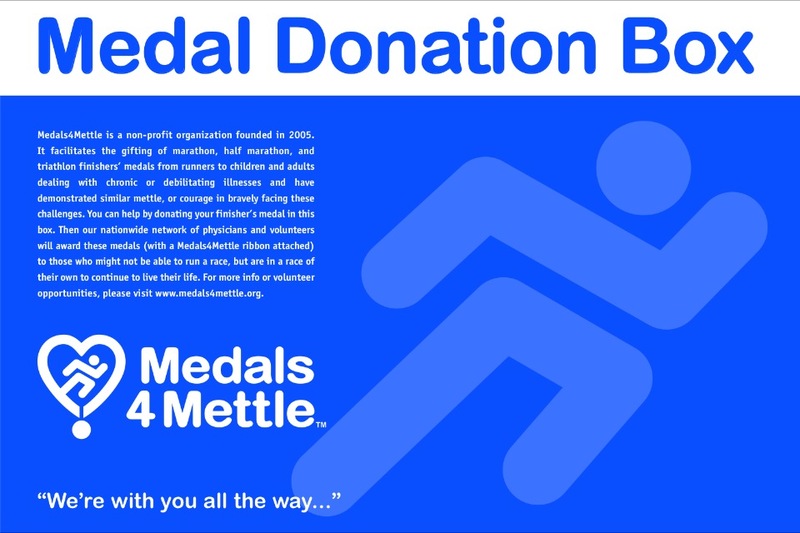 Medals4Mettle is a non-profit organization founded in 2005. Medals4Mettle facilitates the gifting of earned marathon, half marathon, and triathlon finishers’ medals from event participants to children and adults dealing with chronic, debilitating or life-threatening illness. We do this as a celebration of the human spirit, knowing that while our medal recipients may not be out on the race course with us, they are fighting in the race for their own lives. 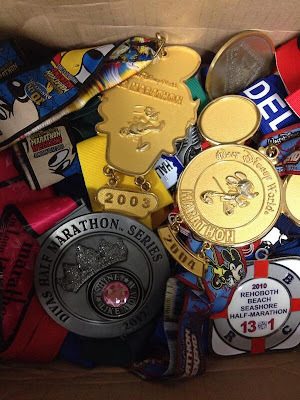 Over the past 9 years, Medals4Mettle has presented over 45,000 medals to deserving children and adults. 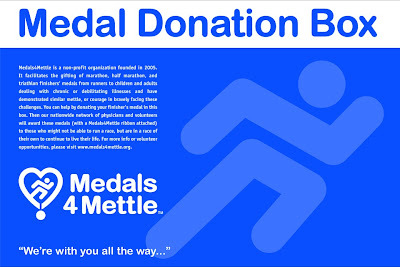 Medals4Mettle is a different kind of charity that does not seek to compete with other charities for valuable dollars. It is our mission to work with established charitable organizations to increase exposure and expand education by providing runners and triathletes with a simple way to gift their medals to others. It is also our hope that this will provide athletes with the opportunity to get to know their recipient or a charitable cause, and learn more about the disease or other problem that they have faced so courageously. Only a fraction of marathon runners run for a charity and Medals4Mettle believes that the simple gifting of a finisher’s medal is a subtle but effective way to introduce the concept of charitable running. Are donations to you tax-deductible? Yes. 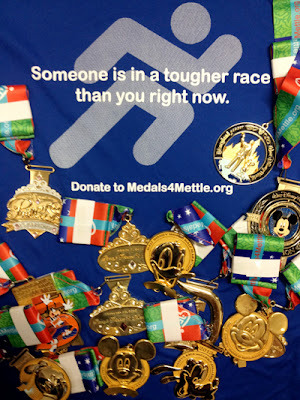 Medals4Mettle is a 501(c)3 nonprofit organization. Donations made to your local chapter or through our website are tax-deductible. Donations of money are always needed to help offset the costs of manufacturing ribbons, distributing and awarding medals to recipients, chapter promotional materials, and ongoing shipping and administration costs of running the organization. Our chapter coordinators are all volunteers that coordinate medal collection and distribution, so your monetary donations truly go towards supporting our medal gifting program. Where do I send my medals? 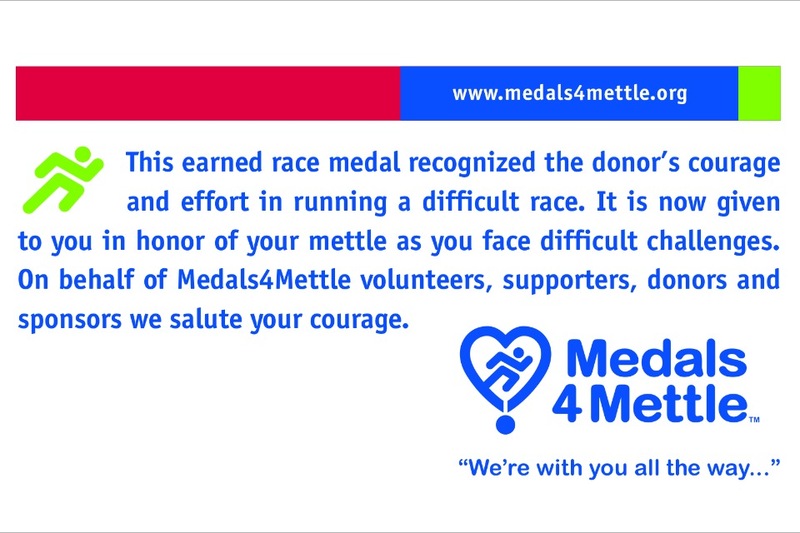 Medals4Mettle has 60 chapters in the United States as well as several chapters in other countries. To find the chapter closest to you, visit http://www.medals4mettle.org/chapters.html/If you do not have a chapter in your state, medals can be sent to our headquarters in Indianapolis, IN. Please note that many of our chapters have drop-off locations at local running stores, or may pick up medals at local race expos. Contact your local chapter coordinator if you have any questions. How should I send the medals? If at all possible, we ask that you remove the ribbons before mailing. Please wrap the medals in bubble-wrap or paper to help prevent damage in shipment. If you are sending a large quantity of medals, we recommend that you use USPS Priority Flat Rate boxes; this tends to be the cheapest as you pay one postage rate regardless of the weight. We also encourage you to tell us about yourself and where the medal is from to provide us and M4M recipients some background on you and your gift. What kinds of medals do you accept? 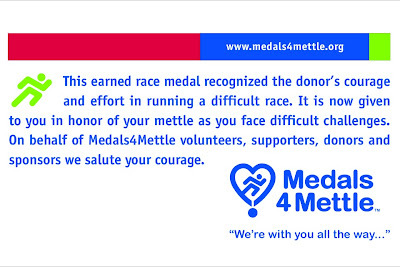 Medals4Mettle accepts only earned marathon, half-marathon, or triathlon medals. In the spirit of fostering philanthropy, we also accept any medals earned by children who wish to donate their medals to other children. Can I send you my old trophies or awards from other sports? We appreciate your donated race medals, however please do not send badges, pins, patches, stickers, plaques, ribbons or trophies as these cannot be used. Only the medals noted above are accepted. I am a race director and I have extra medals that were never given out. Can I send you those? We ask that only earned race medals be sent in. One of the most important parts of our program is that the medals presented were donated by athletes who earned them and wanted to pass them along to someone who they felt needed them more. Please do not send extra/unearned medals or medals from a race that was cancelled. What happens to the medals I send you? ,Medals are presented to children and adults, either in hospital settings, group settings, or on an individual basis. The medals are presented to those who are fighting serious life-threatening illnesses, such as cancer, or who are facing lifelong debilitating illnesses. The medals are theirs to keep. We do this at no charge to the recipients, hospitals or groups we work with. Can you send a medal to a specific person for me? I want to help Medals4Mettle but I don't have any medals. Are there are other ways I can help? 2. If you are a blogger, writing a blog post about our organization helps spread the word. 3. Follow us on social media: Facebook, Twitter, Pinterest, and YouTube. 4. If you are part of a running or tri club, hold a group collection for Medals4Mettle. 5. 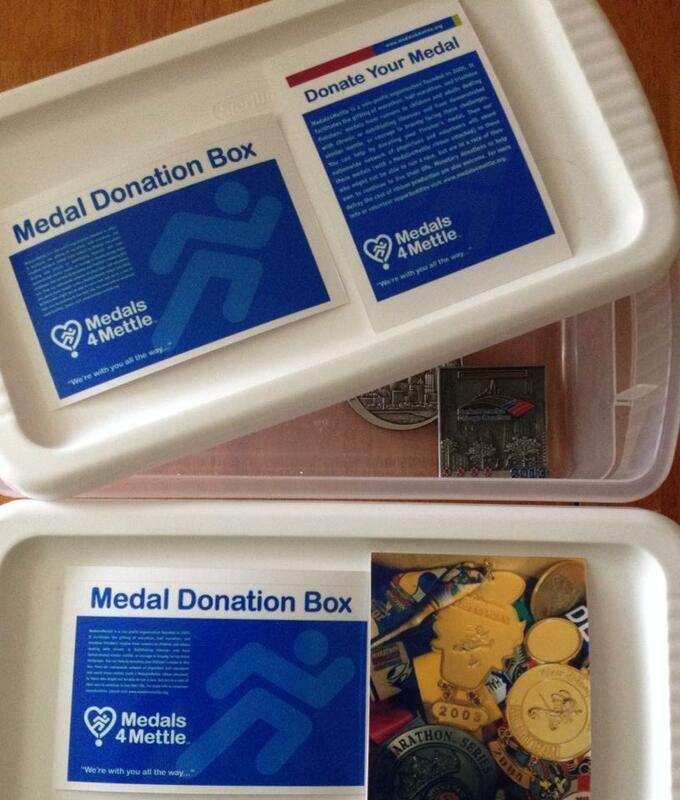 If you work for a running/cycling/athlete retail store, offer to have a medal collection box at your store. 6. Volunteer your time. You don't have to be an athlete to be involved! We have volunteers and chapter coordinators from all walks of life. You can volunteer with your local chapter, or form a chapter in your area if there isn't already one.